Gates Ford have a rich heritage in the motor trade, with a history that stretches back to 1920. Ford Main Dealers across Essex, Hertfordshire, and Middlesex for almost 100 years, Gates have developed a reputation for high standards of service and quality. From our first premises in Woodford, we've expanded to operate eight modern and welcoming sites across Hertfordshire, Essex, and Middlesex that all offer personalised sales and maintenance support. This unique approach to service has seen Gates Ford become the leading name in the region. 1920: Frank Gates father, Cornelius Gates helped him make a start in the fledgling motor industry from premises in High Road, Woodford. It was from here that the Ford Main dealer group expanded. 1927: A new showroom and workshops open in High Road, Woodford. 1938: Saw the opening of new workshops in Chigwell. 1957: Gates take over and re-opened premises in Lea Bridge Road, Leyton and open as Gates of Walthamstow. 1958: A new dealership, Gates of Epping, commences business in Epping High Street. 1959: Gates open an impressive new dealership in Edinburgh Way, Harlow. 1960: Further workshops and parts department open in High Road, Woodford. 1964: In this year, Gates took over and re-opened premises at Station Road, Letchworth. Gates of Letchworth also included an agricultural division, Gates Tractors, in nearby Baldock. 1967: Gates of Stortford opens in London Road, Bishops Stortford. 1968: Jack Warner, best known for his role in Dixon of Dock Green, officially opens a launch event​ at Gates of Harlow to celebrate the redevelopment of the premises on Edinburgh Way. 1970: Saw the opening of Gates of Hitchin in Bancroft, Hitchin. 1979: A commercial vehicle division commences business with the opening of new premises as Gates of Waltham Abbey. 1992: Gates of Bishop's Stortford relocates to a larger site on Stansted Road, Bishop's Stortford. 1994: Gates of Epping move into a larger, much improved dealership in High Street, Epping. 1995: Saw the sale of premises and businesses in Woodford, Chigwell, Walthamstow, Waltham Abbey, Letchworth, Baldock and Hitchin to take the company back into private ownership during 1996. 1997: Gates move in to Hertford with a takeover of an existing dealership, and set about making dramatic improvements. 2000: Another dealership is added to the group with the opening of Gates of Waltham Cross in Britannia Road. 2001: Gates unveil the totally re-developed showroom at Gates of Hertford. 2002: Saw the takeover of premises in Danestrete and Gunnelswood Road, Stevenage and the re-purchasing of premises in Station Road, Letchworth. 2003: A new state of the art showroom opens on Arlington Business Park, Gunnelswood Road, Stevenage. The new dealership took the standard of the modern showroom to a new level and illustrated further, the ambition of the Gates family. Major refurbishment of existing premises in Gunnelswood Road also takes place. 2004: Gates open a new branch in Chelmsford Road, Great Dunmow. 2004: Gates Trade Car Sales open in Gunnelswood Road, Stevenage alongside new improved accident repair centre facilities. 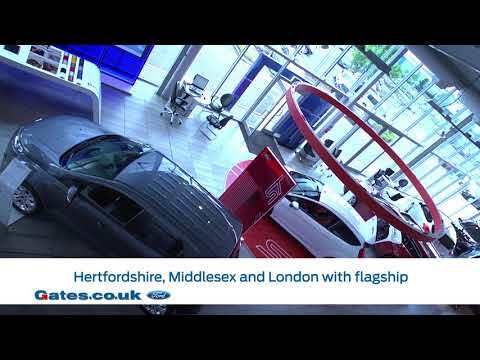 2005: Five dealerships undergo major refurbishment - Gates of Harlow, Stortford, Epping, Waltham Cross and Letchworth. 2010: Gates celebrate their 90 year anniversary. 2012: Gates open the Part X Sales Centre in Gunnelswood Road, Stevenage. 2013: During December, Gates announce the transfer of two dealerships. Gates of Letchworth relocates to existing premises in Gunnelswood Road, Stevenage whilst Gates of Dunmow relocates to Gates of Stortford. Meanwhile, showroom facilities at Stevenage and Stortford are upgraded to accommodate new customer 'Hello', 'Relax' and 'Discover Ford' zones and customer facilities are expanded in the fully-equipped service departments. Specialist Transit Centres launch at Gates of Harlow and Gates of Stevenage. 2015: Gates of Stevenage and the soon to be redeveloped, Gates of Harlow are approved as locations for Ford's all-new FordStore retail environment. 2016: Gates announce the acquisition of Gates of St Albans in Ashley Road, St Albans, shortly followed by the opening of a Specialist Transit Centre at the site. 2018: Gates acquire four new dealerships including premises in Woodford Green meaning a return to the area where it all began back in 1920. The other newly acquired sites are located in Enfield, Walthamstow and Potters Bar. Why Buy From Gates Ford?